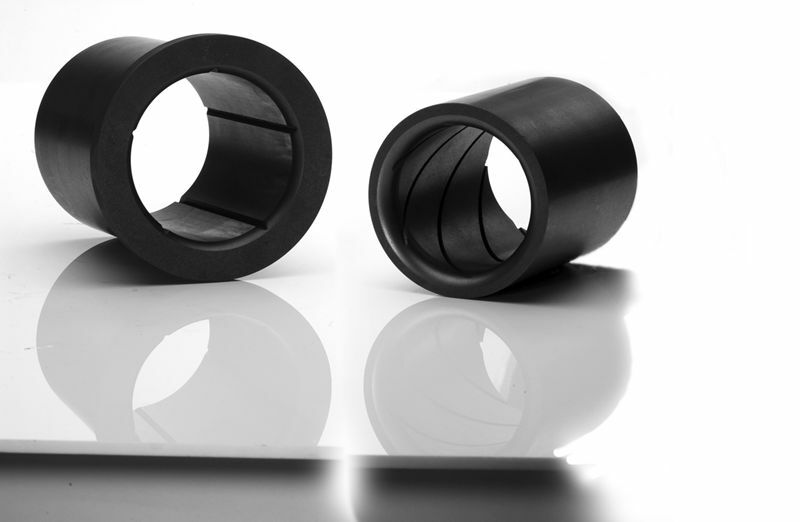 Carbon/graphite bearings are used for running submerged in low viscosity liquids like water, gasoline, hot oil, solvents, strong chemicals, molten metals, and liquefied gases. Metallic bearings are often not satisfactory for these applications because the hydrodynamic film provided by these low viscosity liquids is not thick enough to overcome the strong atomic attraction between metal bearings and the metal shaft. However, since there is no strong atomic attraction between carbon/graphite and a metal shaft, the thin hydrodynamic film provided by low viscosity liquids provides sufficient lubrication for carbon/graphite bearings. Plastic or polymer bearing materials often fail in these submerged applications because of their tendencies to swell, soften or deteriorate. Metcar materials can handle all common chemicals except for a few extremely strong oxidizing agents such as hot, concentrated nitric acid. Metcar bearings for running submerged can be provided to your print or approved dimensions and tolerances. Metcar bearings are also available shrink-fitted into metal housings or metal retaining rings. size limit:Bearing diameters are available up to 24’ OD.